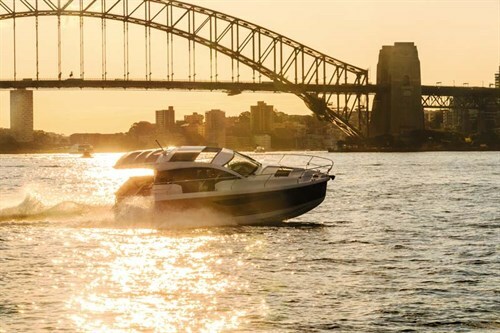 We were first in line to review the new Sealine C330, fresh from its Australian debut at the Sydney Boat Show. 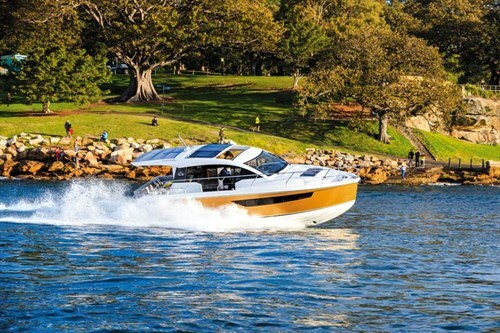 The Sealine was released locally at the recent Sydney International Boat Show, having been previously released in Europe. Two versions are available: the Sealine S330 sports version, and our review boat, the Sealine C330 cruiser. We got the first ride. The Sealine C330 cruiser looked resplendent as its hull sparkled in Sydney’s sunshine under a locally applied 3M golden metallic wrap. Local importer Peter Hrones admitted he wanted to create a bit of fun for the Sealine C330 cruiser local release and you’d have to agree that it looks sensational. It’s a $3750 extra with a life expectancy of up to five years and leaves owners with the option of then choosing a new colour while protecting the gelcoat at the same time. There’s a lot packed into the Sealine C330’s 10.31m (33ft10in) length too, and she is a very family-friendly cruiser with twin cabins, useful galley and three separate lounging spaces. A full-width platform clad in genuine teak welcomes you aboard, and while it’s somewhat narrow it’s wide enough for lazing with feet in the water. An 0.8m extension is available as a factory option and there’s a folding swimladder (in a locker in the saloon sole) to assist you back on board. A pleasant surprise waits in the teak-covered cockpit because bi-fold doors and a large hopper window open the saloon wide for a large entertainment space extending right through to the helm. 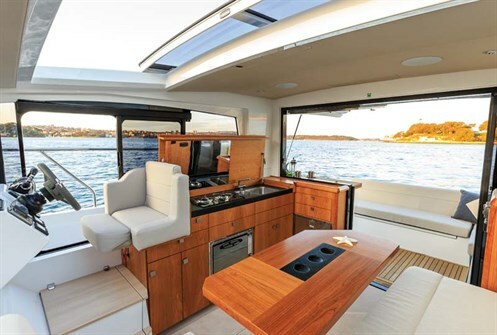 A plush L-shaped lounge wraps across the transom and around the port side, while an awning can be deployed to shade the space or close to soak-up the sunshine. Especially with the doors open, the saloon has a wide, open feel rendered by deep windows all-round and a whopping electric sunroof. Dixon’s interior design is a modern take on a traditional timber look where the darkish matt-finished Manhattan Cherry of cabinets and table are tempered by a light acacia floor, and off-white lounge fabric and ceiling. Set along the port side the raised four-seater lounge affords wide views through the low-set windows and allows social interaction with guests at the cockpit lounge. The timber table swivels for entry and a corner cutout facilitates better access forward. Slots in the floor allow it to be moved on its pedestal base to the cockpit if desired and there is also the option to convert the lounge to an occasional bed. Emphasising the clean, minimalist design, the galley is unobtrusively hidden under a long and elegant timber bench top. Combining with a counter under the rear window the galley has generous proportions for this size boat. It’s a neat trick when you lift the cover to the comprehensive kitchen below. A cooktop has a pair of gas burners alongside a stainless steel sink with hot-water through a designer mixer, while cupboards and drawers as well as a Smev oven are set below the bench. The return in the corner combines with an outside cabinet to form a large servery with Isotherm fridge-freezers fitted below. Steps take you down to twin cabins below with accommodation for two couples or a family with children. Head height will suit tall individuals but beamier folk may find the doors a tad narrow. 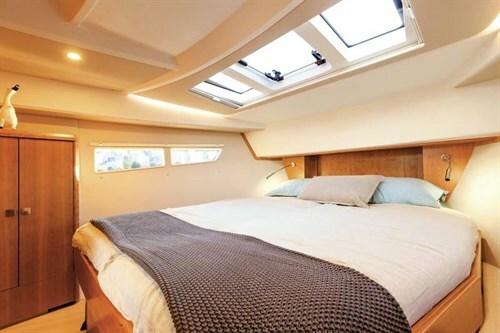 The main cabin in the bow has an island bed with good access either side and enough room for a narrow bench seat on the sloping hull walls. Twin windows each side provide great views and contribute to making the room feel bigger than it is. Three more windows overhead include a central hatch for more light and good airflow. We should award marks for innovation in the portside second cabin as it can be configured into two singles running north-south or, by adding an infill a double running east-west. Located under the saloon sole, head height is limited with just enough to sit up against the sides in the double layout, but you get full height at the entry, a seat and two windows. These cabins share the starboardside head with day guests, as is the compromise for it to be a wet head rather than a full bathroom with separate shower. Head height is around 1.8m and although shared by a bench with vanity and a Jabsco toilet most will find room enough to shower. Hot water is from either the engine or shorepower and the electric macerator toilet empties to a 60lt holding tank. 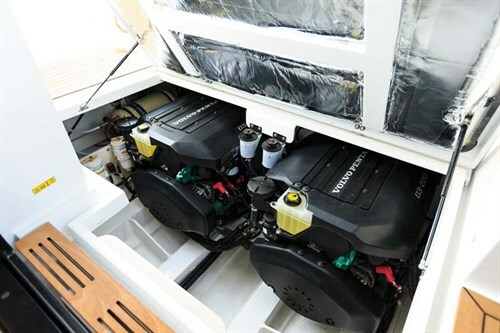 Engine options for the Sealine C330 cruiser are single 330 or 400hp units or twin 170 or 220hp power plants, all Volvo Pentas. Our boat had the most powerful setup: two D3 diesels delivering lively performance and a surefooted Duoprop drive. We were out of the hole and planing at 13kts and 2700rpm and held a comfortable cruise of 20kts at 3200. I got 30kts at 3800rpm and Hrones says they hit 35kts later in the day, but 30kts is probably on the mark once it gets antifouled. Handling is lively, the ride across nasty chop pleasantly soft, and she is easy to flick around courtesy of the new finger-light electronic steering. The Sealine C330 cruiser price starts at $389,800 for a single-engine boat, while our fully loaded review boat spiked to a $457,245 price. The Sealine C330 will suit both young families and retirees, who like the idea of cruising with the option of overnighting or port-hopping their way along the coast.